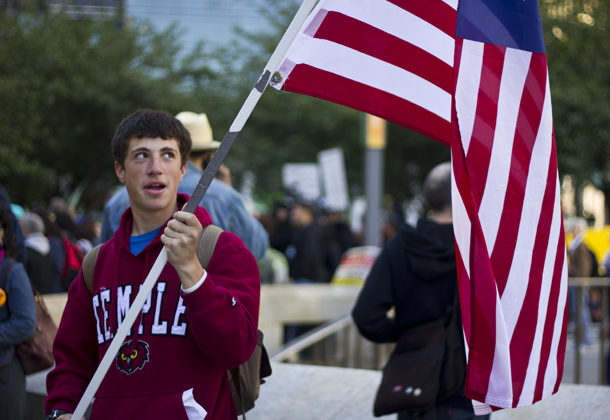 Temple students made their presence at the start of Occupy Philadelphia. Since they started three weeks ago, the Occupy Wall Street demonstrations have spawned similar protests across the country, connecting Americans with a diverse list of grievances under an umbrella movement. At about 9 a.m. today, Oct. 6, citizens took to City Hall in Center City for Occupy Philadelphia, an organized effort equipped with pro-bono lawyers, facilitators and committees charged with handling food, medical services and daycare, among other things. The demonstration, largely against wealth inequalities and what protestors call corporate greed, was home to sign-wielding activists, many of which were decrying the wealth of the top one percent of households and the economic hardships of average Americans. Facilitators at the event frequently reminded protestors to remain peaceful and that city officials were on their side. While the demonstration in New York City has yielded many arrests and cases of violence, no arrests or citations had been given as of 7:30 p.m. tonight, according to an email from Lieutenant Raymond Evers, commanding officer of the Philadelphia Police Department’s office of public affairs. Temple students in the crowd sported university gear, marking a clear presence at the start of the event. ANGELO FICHERA TTN | Jake Berman, a freshman university studies major, carries a colonial-era flag at today's demonstration. Ann Matthew, a freshman urban studies major, said it was her first time participating in a protest, alongside freshman sports management major Laura Martin. “I’m out here to support anti-capitalism,” Martin said. Matthew and Martin said they wouldn’t be camping out with the crowds but said they skipped class to attend the start of the demonstration. The diverse list of causes was an attraction for some students to get involved in Occupy Philadelphia. “What I like is that there are a lot of directions that this can go in, there’s so many different types of groups here,” Evan Hoskins, a sophomore history and Russian major. Hoskins is a member of Temple Democratic Socialists, a group present at the action. Hoskins said he was interested to see the objectives and goals that will come out of the assembly. “I’m really excited to see what happens in terms of what we decide to say that we want. I think that’s why as socialists we need to be here and really try to push that in a socialist direction,” Hoskins said. “I’m a Temple student…there’s a huge industry that makes money off the suffering of student [loans] and exploits [students,]” Donald Hopkins, a senior philosophy major, said. Hopkins cited state budget cuts as one of many reasons he was taking part in Occupy Philadelphia. He added that he’ll be at City Hall for the protests as much as possible. For some students, though, the event offered an experiential education. Angelo Fichera and Kate Kelly can be reached at news@temple-news.com. For a longer, expanded version of this story, pick up The Temple News on Tuesday, Oct. 11. Video shot/edited by Angelo Fichera. Voiceover by Kierra Bussey. Stop Islamization of America speakers ignited student debate. That pretty much sums up the idiocy of Occupy Philadelphia. It really shows how intelligent today’s college students are when they protest capitalism. Notice how no Economics majors or Business majors are out there. Is anyone from the Responsible Business SPO protesting even? The fact that people think that Corporations hoard money is ridiculous. You can thank corporations for your cereal, your cars, your pencils and paper. Without corporations, this country would be an agrarian economy with no room for people to be film majors and Spanish majors and any other majors that don’t understand the economy. Please, someone tell me how corporations are so awful, especially since they are the *largest* employers in the country. Over 50% of the top employers in Pennsylvania alone are incorporated. You despise corporate lobbying but don’t care about the private unions that lobby as well that make things more expensive for society and keep breeding that sense of entitlement that permeates through American culture today. Occupy Philadelphia is simply against money controlling who is in office and how the nation/cities is/are run. Think about it. The campaigns with the most money run the most ads and usually wind up in office. The ads are hate-filled and nasty. What a disgusting way to run a country. Small business are suffocated by Walmarts and monolpolies (Hello, Comcast). How is that any way to live? The only reason why they are apparently the only ones able to give jobs is because they are making it nearly impossible for small businesses to survive! The next time you pick up something and see “made in China,” think about all of those corporations giving money to other countries instead of its own. Note, this is from the 2008 Election. Ron Paul will not win the Republican Nomination and Perry (cited there with $17 Million) is behind Romney and Cain (Cain has raised much less). Now, Wal-Mart and Comcast are *not* monopolies. They are not the sole providers of a good or service across the whole market. You have, for instance, Target (and if you consider Wal-Mart’s grocery section), Giant, Giant Eagle, Food Lion, Acme, Genaurdi’s (they may be out of business, I can’t recall), Piggly-Wiggly’s etc, etc. Small businesses are great and all, but large businesses bring things to the consumer cheaper. It is much easier for larger companies with the logistical and economic capabilities of providing goods and services to a large number of people cheaper than a small business. If you haven’t noticed, the “99%’s” liberal furor and the Unions that support them have brought about the Patient Protection and Affordable Care Act (otherwise known as “Obamacare” by opponents). The individual mandate and threat of tax punishment by not providing healthcare to your employees is causing small businesses to not hire and are going to cause many of the small businesses to fold in upon themselves. Many corporations already give Healthcare and Insurance to their workers – Giant Food Stores already gives decent insurance to part-time workers. So tell me, with the ignorance of basic economics, how does the “99%” and OWS/Philly plan to fix the problems of corporations? Especially since corporations are some of the best places in America and the world to work?